A cooking instructor is often asked about the safety of the non-stick frying pans. The users of these pans love cooking in these because none of the ingredients get stuck on the inner walls of the pan and are easy to clean. If one does not consume much oil in his or her diet then the non-stick pans can prove to be the dream cookware for him or her especially when preparing dishes like burgers, pancakes, fried chips or snacks, etc. These dishes usually needs more amount of oil to get cooked but if preparing in the non-stick pan then just a few drops of oil will be more than enough. Due to the multiple layered coatings, food does not get stuck to these pans. The non-stick coatings are actually sprayed on the aluminum or the stainless steel cookware and are then heated at extreme temperatures to alleviate the ultimate finishing. The home cooks are frequently concerned about the non-stick fry pans, thus, wondering if the chemicals that are used in the manufacturing process may get released into the food and end up in the consumer’s body. Mainly, overheating these kinds of pans causes the breakdown of the coatings that can release the toxic gases and certain other particles. Hence, overheating should be avoided. 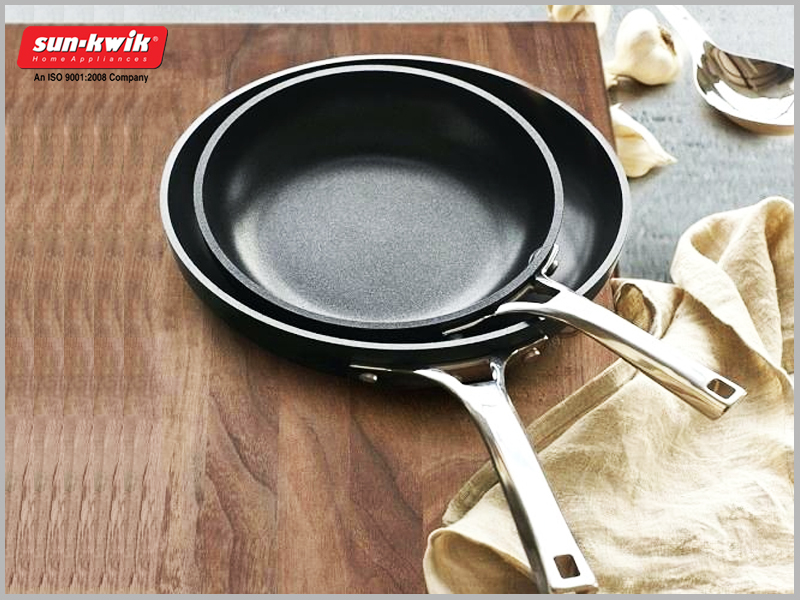 It is the best to Buy Fry Pan Online to get the chance of choosing the best one from the plethora of premium cookware. Tips for a safer non-stick fry pan usage are listed below. Use the non-stick fry pan on medium or low heat. Overheating of these pans can cause the coating to breakdown that can ultimately lead to the release of the toxins and certain other harmful particles too. Cover most of the pan’s surface be it any preparation as this can help in keeping the temperature of the pan a bit down while cooking. Only pre-heat the non-stick fry pans on low or medium heat. Add just a tablespoon of oil to the pan as the pan heat up. The pan is then ready to make any dish for the foodie. Do not use these kinds of pans over the power burners. Use a good quality non-stick fry pan. The cheaper and the light weighted non-stick coated fry pans get heated up too fast, which is not good. Invest in the heavier-bottomed ones to cook more uniformly and safely. If one drift towards cooking on high heat only, do not use a non-stick fry pan. Use a ceramic cooking wok instead. Ventilate the kitchen while cooking and run the exhaust fan to move out the fumes and the stuffy air. Do not wash the non-stick fry pans in a dishwasher. This will help to keep them in good condition for longer time. Try to avoid chipping or scratching your non-stick fry pan. Use the wooden or the silicon utensils to stir the ingredients instead of any metallic utensil. Replace moderately used non-stick fry pans every three to four years. Besides different models of fry pans, the online store is also popular for the best quality Induction Based Cooker. Different sizes of the premium quality cookers are available here at the best prices for your induction burner.